Family Discount of £100pp for bookings of 4 that include 2 children. Activity holidays are suitable for teenagers not younger children. For groups or multiple family bookings we can build a week to request exclusive to your group. We recommend booking these activities BEFORE travelling – contact us and we can advise on the various activity providers available. 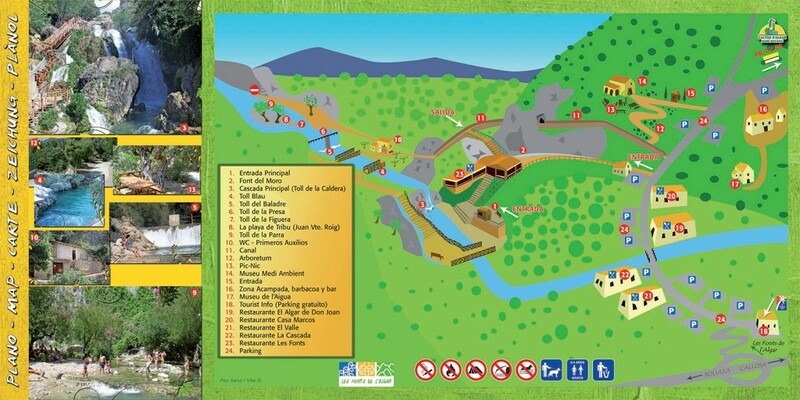 The area also boasts some of the best theme parks in Spain including 3 water parks Aqualandia, Aqua Natura and Mundomar. At Terra Mitica adventure park, you are sure to find a rollercoaster to scare even the bravest and Terra Natura is a safari park featuring animals from all over the world in their natural habitats. We are happy to assist in organizing trips to any of the parks. For those interested in adventure travel and activities around the world. Please have a look below we have over 1500 adventures listed for you to explore. We have not done them all but we are getting there! Thousands of photos and descriptions plus hundreds of adventure videos. Any questions please ask and let us know if you find it useful. We will have UK £ and Euros on it soon! The year round sun ensures that climbing is available all year round and the scale and range of the routes ensure that their is something for everyone from beginner to intermediate to expert. The Coast is also so close to Splash Finca Panoramica that you can climb in the mountains in the morning and on the coastal cliffs in the afternoon. We can arrange climbing courses for individuals or groups or arrange for one of the many local guides to take you on some of the more challenging routes if you already have experience. Experienced climbers can just use the Finca as a base and head of on their own. We were are the forefront of introducing the sport into Scotland and the UK and we now take more people canyoning in the UK than anyone else. We also canyon year round in Morocco. To date we have taken nearly 10000 people canyoning in a safe and fun manner. Canyoning is a activity that inspires and delivers every time. The region around our mountain Finca base is home to six great canyons with the added advantage that the great weather which ensures the canyons are not like some of the ones we work in back home in Scotland! 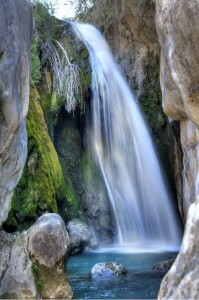 Canyoning in this area of Spain is also a year round activity. However, although the sun does shine here over 300 days a year when it rains it can rain exceedingly heavy and flash floods are common at these times. You do not want to be in a canyon during these periods. Please ensure you go with experienced canyon guides. This is not a adventure activity that should be tried out on your own! The list below are canyons that we most commonly use, as time allows we will publish comprehensive guides for each. We run canyoning day tours as well as canyoning weekend breaks and also a full week canyoning holiday. On all our canyoning trips helmets are compulsory at all times on the journey when in the canyon. Buoyancy aids and wetsuits will be worn under our discretion depending on the canyon and weather. We may test suitability of people for abseiling prior to entering a canyon. For those of limited or no canyoning experience we will probably use a lowering system rather than abseiling. A day of canyoning is £50 per person of £75 per person for fit individuals who want to do two canyons. A canyoning full week holiday is £725 per person full board. ( maximum of 12 people only suitable for those who are fit and healthy as the days can be long. Good head for heights essential. We also include a via ferrata trip in this week. This area of the Costa Blanca in Spain is a renowned destination for mountain biking and cycling fans of all types and abilities. The surrounding area is a mecca of challenging single track trails, tough accents with fantastic descents. There are also plenty of easier routes and converted railway lines which are called greenways. September each year often sees the Tour of Spain pass through the area where some of the very best road cyclists in the world compete over the regions’ hills and valleys. The winter months see many of the top road cycling teams staying in the area for weeks on end as it is an ideal training base for them to prepare for the coming racing season. 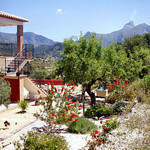 Our location and Finca make an idea base for those wanting to do a cycling holiday of any type. It is also available on an exclusive use basis to cycling groups and teams for hire on a self catering or guest house basis. The surrounding mountains and countryside around Splash Finca Panoramica offer some of the best hill walking and hiking in Europe! 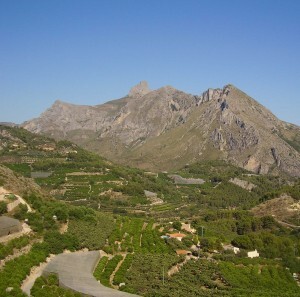 From your balcony you will glimpse upon the majestic Sierra de Bernia mountains (covering the municipalities of Altea, Benissa, Calpe, Callosa d’En Sarriá and Jalón) which rise to 1,130 metres (3,704 ft) at their highest and separate the Alicante regions of Marina Alta and Marina Baja along the Calpe, Benissa and Altea border. 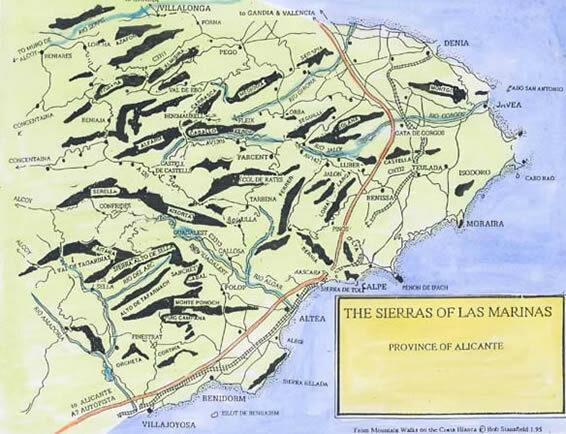 This formidable natural barrier – which features the Font del Garroferet and an ancient fortress – is one of Spain’s many mountain ranges and is crossed by tunnels that carry the N332 national road, the A7 motorway and the railway. It was one of the most technically difficult stretches of construction on Spain’s Autopista del Mediterraneo. The southern side of the Bernia range overlooks beautiful Altea Bay, making a gentle arc with the old hilltop town of Altea at its centre and curving around to its far end at Albir and the Sierra Helada. The attractive palm lined promenade of Altea is being extended along to Albir village and the Puerto Deportivo Luis Campomanes is current being enlarged to accommodate the strong demand for berths. Alternative harbours are the Calpe Club Nautico under the Peñon de Ifach, and Moraira Club Nautico The mountainous backdrop to all the resorts along the Costa Blanca are one of its most spectacular and beautiful features – just a short drive away! 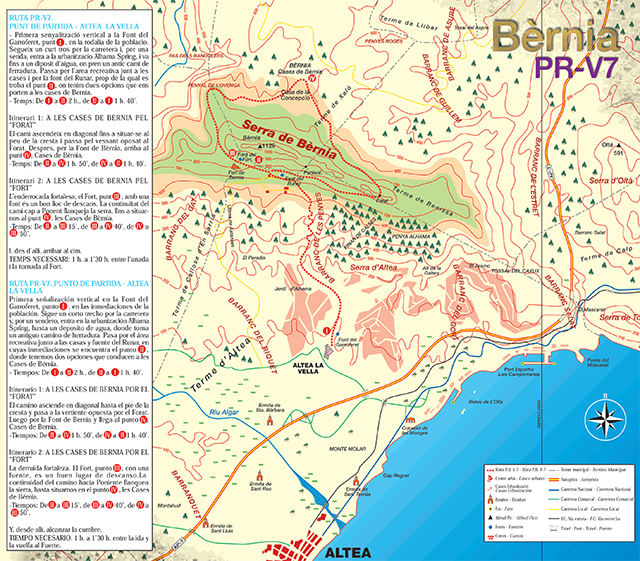 The Sierra Bernia PRV-7 routes attracts hillwalking and hiking enthusiasts from across Spain and abroad, with a range of distances an difficulties to suit every climber. We could not be better located for day walks or walking holidays. 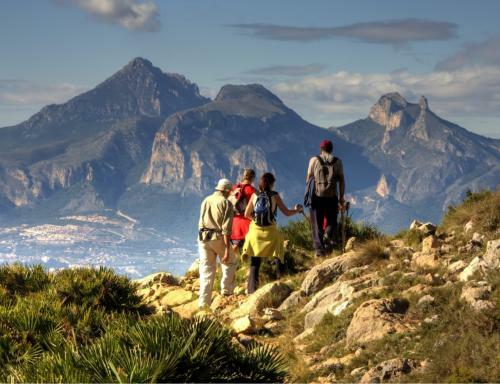 With 78 different mountain and valley walks around us there is something to suit everyone. We can provide guided walks or you can do self guided walks. One Week Full Board staying at Splash Finca Panoramica with 5 days of guided walks is £675pp. For those wanting two weeks add a 2nd week self guided B&B basis for an extra £200pp. We take a maximum of 10 clients on our guided walking weeks and 14 on self guided weeks. For group bookings of 10 on guided and 12 plus on self guided there is a 10% discount. For established walking groups we also rent out the whole Finca on a Self catering basis for your walking holiday for a week or two. Please enquire for a price. This option can make your walking holiday as little as £150 pp depending on fill rate and time of year. Our walking weeks run Sat to Sat and Alicante airport is by far the best airport to arrive at. The third week in every month Jan-June and Sept-Dec. Other weeks can be arranged on request. Splash. 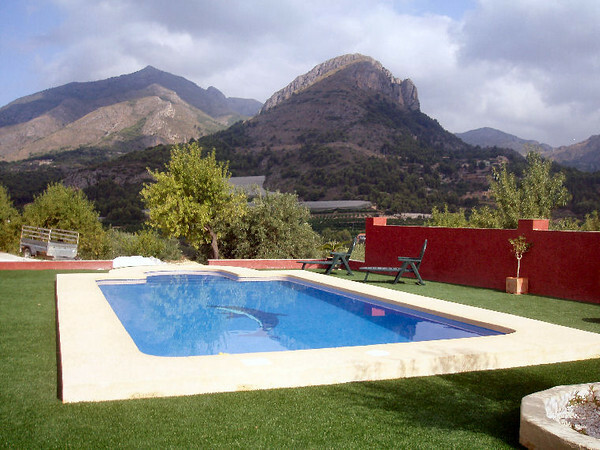 Nestled in the stunning Alicante mountains – yet still only 30 mins drive from the beaches of Benidorm – the villa is ideally situated. Take the stress out of organising your holiday – all your accommodation is arranged and a huge range of activities are on hand to cater for all tastes, whether you’re looking to relax by the pool with a cocktail or something a little more adventurous. This luxury Finca is the ideal place to chill out with all your friends but give you access to some great hen weekend party activities and also the crazy nightlife of Benidorm required. Collect and return from Alicante airport. 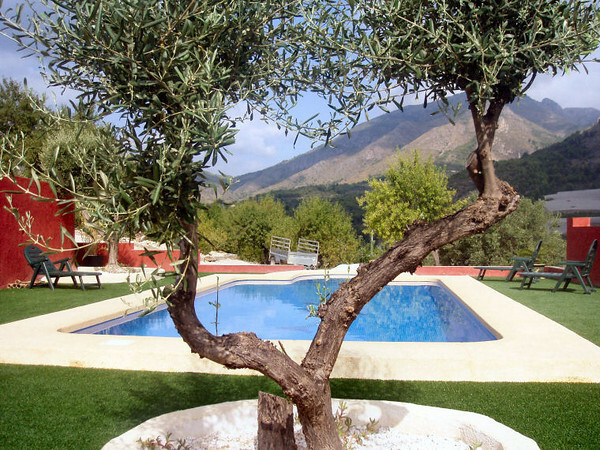 Two nights self catering at Finca Splash, plus a full day of adventure fun activities on the Saturday plus a night out in Benidorm if required on the Saturday night picking you up in the wee small hours. Cost is £145 per person for bookings of 12-18 and £165pp for bookings 8-11. 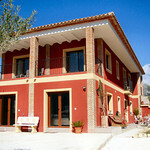 Special for 2012 with bookings made before March is a 3 night for 2 offer you may need the third day to recover by the pool! If you require a chef to cook for your whole party over the weekend that can be arranged or maybe just a BBQ on arrival or departure evening. These are available at a extra cost just ask.